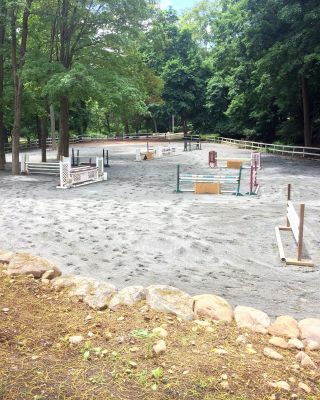 Winter Haven Equestrian Center is located on 3.2 bucolic acres in the historic town of Oakland, NJ. Winter Haven is family owned and operated since 2008. The professionally licensed staff are friendly, extremely experienced, and well educated. Everyone at Winter Haven constantly strives to provide the best care for your horse/pony, the most attentive lessons, and a very individualized training program for you as well as your mount. We offer horse boarding, an indoor riding arena, a 1 acre sand outdoor grand prix riding arena, lessons from the beginner to advanced in Hunters, Jumpers, & Equitation, full and half leases, sales and training, and horse showing. Feel free to call and set up an appointment to come by and tour the facility. See the difference from what was to what will be...It's the Winter Haven Way! WHEC offers 2 levels of base board, depending on where your horse/pony's stall is located. WHEC currently has stalls available. Please call or email for further information. You will be amazed and in awe at the quality and abilities of our lesson horses and ponies. Safety and quietness are our top priorities and requirements when we search for our lesson horses/ponies. Our horses/ponies come from all over the United States and we are constantly looking for new additions to our ever expanding program. WHEC offers a variety of leases and sales on property. If we do not have what you are looking for, our extremely professional and knowledgeable trainers will search and find through their extensive lists of affiliates exactly what you want and need.